Are you getting complaints that you’re impossible to buy for since you de-clutterred your home and possessions? Or do you have a simple living enthusiast in your life that you’re struggling to find a gift for? 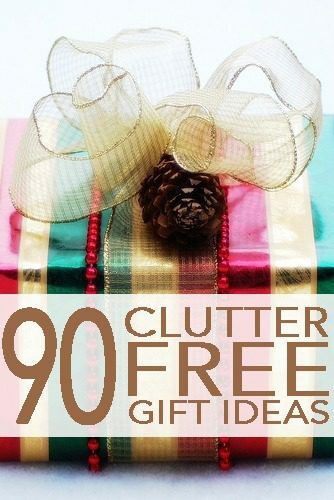 Here is a list of 90 clutter-free gifts to give and receive this holiday season. Things to nibble, sip, read, watch, learn, laugh, smell, relax, pamper, sweat through and love. Nothing to dust. Gifting something to eat or drink is a great way to introduce a friend to a treasured delicacy. The recipe links in here are from some of my favorite food writers. The peppermint bark is divine, and I made many, many batches of the biscotti as favors for my wedding. Homemade Food Gifts: soup ingredients in a jar, dessert ingredients in a jar, make your own Smores, hot chocolate mix, trail mix, peanut butter granola, a frozen meal that you have prepared with them in mind and that they can thaw out for an easy and delicious dinner amid the holiday busyness. Tip: if you receive an experience gift make sure to send a review and some more gratitude to the person post-use. It will make the gift feel tangible and encourage more experience gift giving. Season pass or annual membership to a museum, art gallery, aquarium, science centre, amusement park or zoo. Tickets or passes for ice skating, swimming, skiing, snowshoeing, indoor rock climbing. Own a holiday property? Gift a few nights to a friend or relative. Own a boat? Give an afternoon out on the lake in the summer. Look into local stores that the recipient enjoys. Things like small cafes, specialty stores, hobby stores or perhaps a prepaid punch card for a drop-in yoga class. The other way to put more meaning behind a gift card is to attach a note suggesting what the card could be used for. Ex. iTunes Gift Card: I know you’ve wanted album ______ – here it is! or for an electronics store gift card: a little something to help with the iPod you’ve been saving up for. Amazon Gift Card This is pretty much the gift card for everything and anything. Include a note with a suggested purchase. Starbucks Gift Card For your friend that refuses to get their morning java anywhere else. You probably know them best so what’s the one thing your partner always asks you for more of? Sleep-In Tickets Great if you have children or a dog that needs walking in the early morning. Romantic Letter Tell the person you love why you love them. Thank them for all that they do for you. I have a small box of letters my husband sent me when we were dating and all the ones since. I love to read them again once or twice a year. Chore Tickets Take over some household duties for your significant other. These don’t have to be big jobs like painting a bathroom. It could be as simple as doing their laundry or packing a lunch. Half the fun of the gift will be your spouse thinking up elaborate and hilarious chores before they simply ask you if you could unload the dishwasher. Everyone has some sort of expertise and chances are they also have a friend that wants to learn whatever the skill is. From baking bread to making homemade yogurt to decoupage to using PhotoShop, many of us have talents and knowledge that would make excellent clutter-free and useful gifts to our friends. This is a gift that you should feel quite confident in giving. Perhaps the recipient has mentioned a few times that they would like you to show them how to start a blog or knit socks. Make a nice card up detailing the gift and even suggest some dates that you’re available. Personal Taxes If you’re one of those enjoys filing taxes people, like me, offer to help a friend that loathes the paperwork. Who couldn’t use an extra set of hands for a project? Offering your help for a big task is a wonderful gift for friends and family. Be sure to offer an amount of time that you can reasonably fit in your schedule. It’s true, these gifts could clutter up a hard drive or someone’s spare time. But they won’t clutter up the home so I’m including them here. Flickr Pro Account For the photographer in your life. Kindle Book. If you have a Kindle owner to give to you can give them a book for their Kindle by selecting “Give as Gift” on Amazon Kindle book descriptions. Personally, I’d love to receive 168 Hour: You Have More Time Thank You Think by Laura Vanderkam. Listen carefully to your friends and loved ones. They’ll often mention things that are on their life list or bucket list. Usually it’s prefaced with “someday I’d like to learn to _____” and the person will get all wistful. Here is your chance to help them learn something new and strike something off their bucket list. If you decide to give the gift of learning think about how and when the recipient will use the gift. Look for courses that run in sessions year round and that will hold tuition for at least a year. When you keep hearing the phrase “I have everything I need” consider the gift of a charitable contribution. Donation to their favorite charity in their name. Goat, ducks, clean water, honeybees, send a girl to school, small business start-up cash and so much more to people in a developing nation through Heifer International. One Less Gift gift certificate from Miss Minimalist. Potluck Dinner Replace a gift exchange or expensive restaurant celebration with a potluck dinner. Just say it. Tell someone that they’re important to you but you’d like to stop exchanging gifts and find another way to mark the importance of your friendship. They’ll be as relieved as you are to not have another name on the ‘to buy for’ list. What clutter free gift would you like to give or receive this year? I would like to get a “gift card” with a redeemable lunch or coffee date with a friend I dont see very often.